In April 2017, Sandra was paralysed below the neck and was diagnosed with Longitudinally Extensive Transverse Myelitis. Sandra spent five months in Inpatient Rehabilitation at Castle Hill Hospital as well as spending some time at Pinderfields Hospital. Sandra’s recovery was further complicated by a fall resulting in a fractured femur and orthopaedic surgery in October 2017. 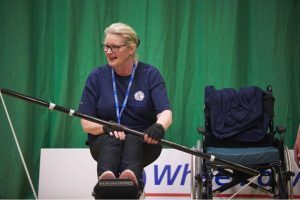 In January 2018, Sandra came to MOTIONrehab seeking specialist neurological physiotherapy. Sandra walked indoors with two crutches and an ankle foot orthosis (AFO) due to residual left leg weakness and foot drop. She could manage stairs but only once in the morning and once at night to conserve her energy as movement in general took a lot of effort and was very tiring. Sandra could walk short distances outdoors but relied mostly on her wheelchair. Sandra’s goals were to increase her activity and fitness levels, improve her left leg range of movement, along with strengthen and improve mobility. Sandra was previously a keen runner and she had completed several marathons. Sandra has been working with MOTIONrehab’s physiotherapist Julie Hughes, using hands-on therapy, taping and exercise to improve the movement and activity of her left foot, strengthening the left leg, core stability and reducing her reliance on walking aids. 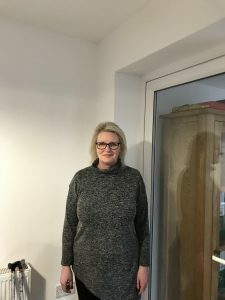 Sandra has put a significant effort into increasing her activity levels between therapy sessions by completing a gym based exercise program as well as pilates, swimming and using electrical stimulation to the muscles activating her left foot. Sandra has now progressed to walking with one stick around the home and often finds herself “forgetting the stick” due to her improved confidence. Sandra can now walk without the AFO for short periods around the home. She has improved speed and gait and is walking larger distances outdoors. 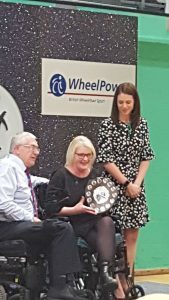 In April 2018, Sandra represented Pinderfields Spinal Unit at the Wheelpower Inter Spinal Unit Games at Stoke Mandeville. Sandra won Best Female Swimmer by taking first place in her three swimming races, 25m breaststroke, 25m backstroke and 50m front crawl. Sandra also went on to achieve 3rd place at table tennis and forth place in archery. What an inspiration.